The Virgin Mary touched the heart of Bruno who then became a faithful servant of hers and a valuable instrument for evangelization. Like the pools of Lourdes, the land of the grotto of “Tre Fontane” made holy by the presence of the Virgin Mary, will work miracles. Bruno Cornacchiola was born on May 9, 1913 in Porta Metronia, Rome. The environment in which he lived with his parents and four brothers proved to be a bad example and a miserable poverty. His father was an alcoholic and would spend time in jail. His mother washed clothes for a living, but she would sometimes follow her husband’s behavior. Bruno only received an elementary education. When he was 14, he received his First Communion, but he then went down the wrong path. Years later, on May 7, 1936, he received the sacrament of Matrimony with Yolanda Lo Gatto from the Catholic Church. Shortly after his wedding, already a member of the leftist party, his friends convinced him to go fight in the Civil War of Spain (1936-1939) alongside the communists. He left his wife behind who was pregnant. After returning home, he did not have any desire to see his wife and little girl whom he did not know. Blinded by his hatred against the Church the only thing he desired was to tell his wife that she should repudiate the Catholic Church. His wife did not allow herself to be convinced by him and this provoked Bruno to beat her. There came a time of so much abuse that Yolanda finally ceded and changed religion; but before she did so she made him promise to receive Holy Communion with him the nine first Fridays of the month. He accepted. After the nine first Fridays, they became Adventists. In April of 1947, Bruno was 34 years old. The superiors of the association of the youth mission of Lacio made known that all leaders should prepare for the public audience they were going to have. Bruno, one of the leaders, needed to make his presentation on April 13th. On Saturday, April 12th, he decided to take his family to a field where he would be allowed to study the Bible and the kids would be able to play. His wife remained at home because she was pregnant. On his way he decided to stay on a field near the abbey of Tre Fontane, the church where Saint Paul was decapitated and where legend says three miraculous fountains sprang up from where the head landed. Exiting the bus, he looked for a place where the kids could play meanwhile he could sit under the shade of a eucalyptus tree to prepare the talk for the next day. Meanwhile his three children, 4-year-old Juan Franco, 7-year-old Carlos, and 10-year-old Isla, played with a ball, Bruno looked in the Protestant Bible proofs for the part of his talk dedicated to refuting the dogmas that referred to the Mother of Jesus. It was 3:30pm. The children had lost the ball and could not find it, so they sought their father’s aid. Bruno stopped taking notes, left his notebook on the ground below the eucalyptus tree, and went to help his children. The notebook remained on the ground. Once he found the ball he began to play with them and in one of the times he kicked the ball, strangely enough, it rose up high and disappeared. Before going to look for it, he asked Carlos to gather all their belongings, the little girl to gather flowers for her mother, and Juan Franco, the smallest, to remain seated. Every so often he would cry out to see if Juan Franco still remained where he had left him. The fourth time he cried out, the little boy did not answer. So he went out to look for him and found him on his knees with his hands together at the foot of the grotto and with his eyes fixed on the grotto, smiling and conversing. So Bruno approached him and heard him say, “Beautiful Lady, Beautiful Lady.” He spoke to him, but the little boy did not react. He went to get Isla and as she arrived at the grotto she also fell to her knees with her hands together and exclaimed, “Beautiful Lady, Beautiful Lady.” He became angry, thinking that they were playing a trick on him. He called Carlos and as he arrived to the grotto, he also fell to his knees and cried out the same words. Thinking that they were playing a game, he tried to lift them up, but he was not able to because they were too heavy. With fear he raised his eyes toward the sky and cried, “My God, save us.” As soon as he said those words, everything around him became dark and he felt a sharp pain in his eyes. Then two white hands touched his eyes as if removing a veil. He fell to his knees and a great light illuminated the grotto and later it became the figure of a woman, dressed with a white tunic tied at the waist with a pink ribbon. Her hair was black and lightly picked up by a green ribbon that fell down, like the tunic, to her bare feet. On her right hand she held an ash colored book (the Book of Revelation-the Bible). The Virgin Mary spoke much that afternoon in April. Amongst other things, she spoke to him about her Assumption into heaven (at that time the dogma had not yet been declared). She told him, “My body could not wither and did not wither.” She then pointed out to the visionary how he could later recognize the two priests who would help him reconcile with God and the Pope whom he had serious intentions of murdering. In this first apparition, the Virgin Mary revealed to him all of Catholic doctrine, asked him to go to confession, and to reconcile himself back to the Church. In an infused way he received all the knowledge of our Catholic faith. She asked him to pray much for the conversion of sinners, specifically to pray the Holy Rosary since each Hail Mary is a golden arrow that penetrates the Heart of Jesus. She promised him to do great miracles for the conversion of the unbelievers. She entrusted to him specific messages for priests, inviting them to a life of greater obedience to the Magisterium, an intense faith in the revealed truths, greater prayer, welcoming a more proper way of dressing, and a pure lifestyle worthy of who they are. As he returned home, he recounted everything to his wife, and the two of them, after seeking the help indicated by the Virgin Mary, returned to the Catholic Church. On May 7, 1947, they renounced their errors. There were three other apparitions: May 6, May 23, and May 30. In the apparition of May 23, Bruno went with a priest and a communist young man to the grotto. Unaware of the apparitions, the young man fell to his knees as soon as he entered the grotto, confessed his sins, asked forgiveness, and was converted. On May 30th, the Virgin Mary asked Bruno to go to the convent of the Philippine Pious Teachers sisters and tell them to pray for unbelievers and for the skepticism of the neighborhood. The apparitions are not yet formally approved by the Church, but they received the blessing of Pope Pius XII given by the Secretary of the State. Pope Pius XII blessed the statue that was taken to the grotto on a procession done on October 5 with the attendance of more than 500,000 people. On December 9, 1949, Bruno visited the Pope and personally handed him the protestant Bible with which he had killed many souls, instilling in them his erroneous interpretation, and the dagger which he intended on using to kill him. He asked forgiveness to the Holy Father and told him everything. The Pope replied by saying that repentance is the greatest forgiveness and gave him the blessing, thereby approving that he go out and preach the mercy of God transmitted through the intercession of the Blessed Virgin Mary. Many happenings and healings have taken place since people began to visit the grotto- the surprising aroma of roses and lilies, the land where the Virgin Mary appeared, healing of people with illnesses. Many conversions have also taken place, specifically of those who are part of Masonry, skepticism, sinners, even Jewish people who entered the Catholic Church, as well as radical changes in the lives and faiths of those who lived erroneously their entire lives. On April 12, 1980 (the week of Easter) at 6pm a Mass concelebrated by eight priests began in the grotto of the apparition, next to the Abbey of Tre Fontane. Many people showed up-- more than 3,000 people who commemorated the apparition of the Virgin Mary of April 12, 1947, also a Saturday of Easter Week. “The sun rose to its zenit, making turns around its own axis and radiating rays of all colors all over. 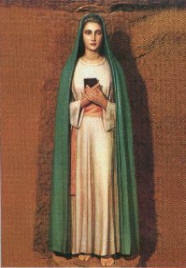 Everyone was frightened; some cried, others screamed, others begged out loud to the Virgin Mary. Another marvelous aspect was the image of the Virgin Mary that at the moment of consecration, became an intense red color, radiating rays that penetrated the roof of the grotto so that they could unite with the rays from the sun. It was a grandiose spectacle, never before seen, and unforgettable. It did not last seconds, but rather half an hour, until the end of the Mass. April 12, 1982, Monday of Easter, Monday of the Angel in the Roman language, the usual annual celebration of the apparition of the Virgin Mary in Tre Fontane took place. During the Mass, at 6pm, the communion of the faithful began, more than had previously been anticipated, and at this same time the phenomenon of the sun began and lasted more than an hour: all saw how, meanwhile many joyfully applauded, the center of the sun was emerald green, surrounded by a pink-orange halo on which a multitude of stars shone, like flames. The sun spun, changed colors, it seemed be approaching while increasing in volume. It threw gusts of light that illuminated the people and the landscape with diverse colors. The reality of the miracle was obvious and undisputed (impossible to be attributed to natural laws), it was perceived by all those present, which included many sick people in wheelchairs. This apparition shows us the great mercy of God towards man and the role of co-redemptrix of the Blessed Virgin Mary, that by her intervention she is able to attain the conversion of one of the most distant sons from the Heart of Jesus, as well as the role each one of us should play in making her known so that many can be converted.